Photo 35. North of Mold, and Nercwys Mountain (seen on the previous page) sediments exposed at Pen yr Henblas Quarry, near Pentre Halkyn, on Halkyn Mountain are probably equivalent in age, and also stratigraphically equivalent, to the coarse grained fluvio-deltaic Cefn y fedw sandstones seen further south. However, here the sediments are very different. They are thinly interbedded, fine grained muds, silts and fine sands, but are heavily cemented in many layers by distinctive, dark grey chert cement. Chert is fine grained, crypto-crystalline silica. 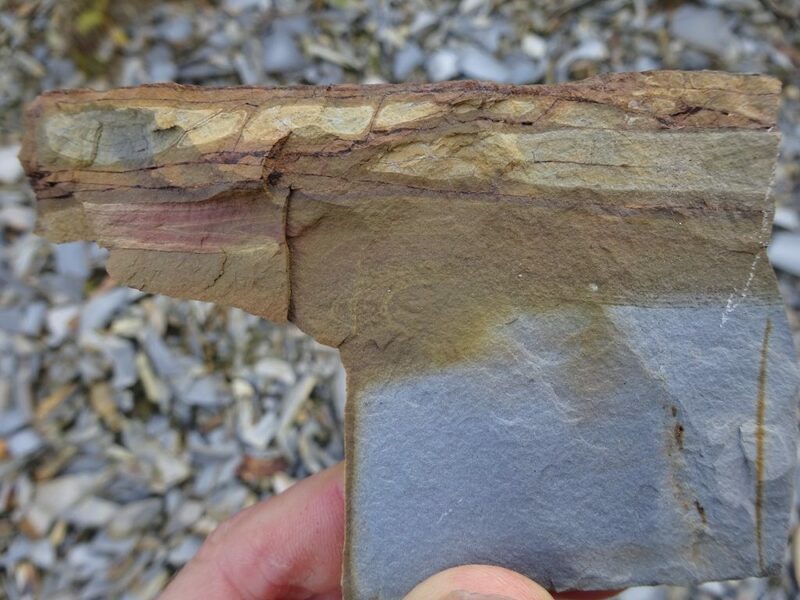 The finer grained sedimentation here, and the siliceous chert cement, probably indicated deeper water, lower energy environments in the deeper marine Craven/Irish Sea Basin off the North Wales Coast. The silica may have originated from dissolution of silica based sponges and radiolarian organisms living in these deeper waters, or may have been supplied by silica rich fluvial inputs from the Cefn y fedw sandstone run-off from the basin margins to the south. Photo 36. Close up view of the distinctive, grey, silica rich chert layers in the Pentre Chert Formation of Pen yr Henblas Quarry. 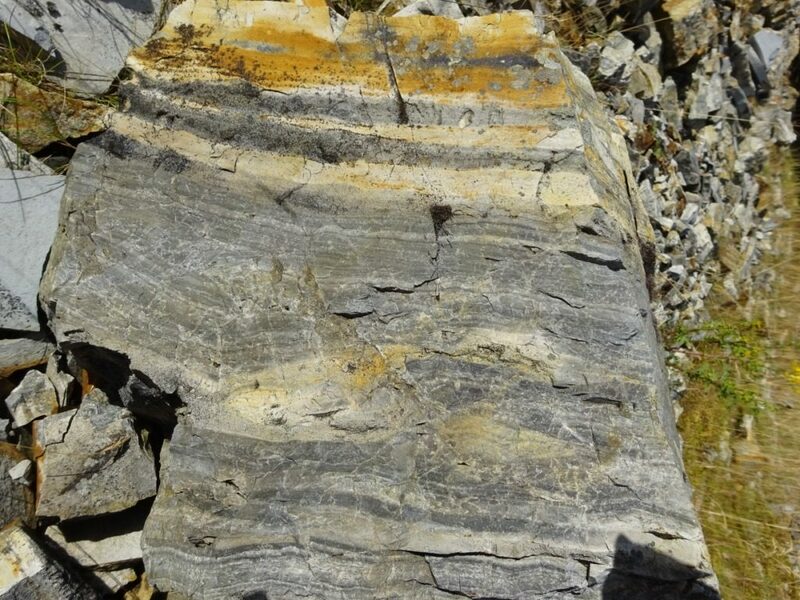 The thinly laminated nature of these sediments (and their interbedded fossils, not seen here) suggests deposition in a low energy, probably deeper water, setting. Photo 37. Fine grained sandstones and mudstones seen in the quarry floor beneath the Pentre Chert Formation, at Pen yr Henblas Quarry. The brown colouration is probably due to iron staining. These sediments may be interbedded, distal equivalents of the Cefn y fedw Sandstone, seen at Nercwys Mountain, to the south.